This past weekend David and I’s moms hosted us an engagement party. It was going to be the first time our extend families had officially met, and the first time any of the families had met our wedding party. With a RSVP list of around 45 people I knew it would be hard to make sure every bridesmaid and groomsmen met every family member so I had to figure out a way for them to stand out. Thinking back to school/work events I decided on name tags! First I started at our local party store. I found buttons that were for the bridesmaids, but there were none for the groomsman. Then I found “write-on” ones but those looked crappy. So I thought why not make them myself? I found some pretty blue and orange flowers and decided to go to town! In PowerPoint I made the tags with a pretty font and printed them out on white paper. 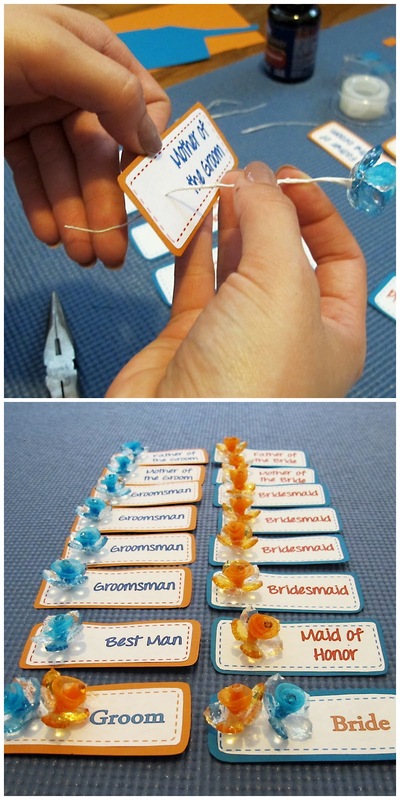 I made tags for the bridesmaids/groomsman, parents of bride/groom, and one for my fiance and I. I made the fonts in alternating colors to distinguish which side of the wedding each person was on. I then cut the tags out and clued them onto colored card stock to add some stiffness/color. Next using a pin or needle, poke a hole in the tag where you want your flower or embellishment to go. Stick the flower/embellishment thorough the hole and pull being careful not tear the tag. Bend the wire over, cute with some pliers, and cover the wire with tape. Using hot glue and a scrap piece of paper; glue a safety pin to the back of the tag. Repeat till you have enough tags! The tags were a big hit at the engagement party. You can also use them at other events such as Showers, Rehearsal Dinner, Bachelor/Bachelorette Parties and even Wedding Dress Shopping! No cup was ever empty in this place and all my guests till this day said it was the best wedding reception and food they had ever been to. Those guys were so professional.